6]). It is a colorless liquid rarely encountered undiluted. Hexafluorosilicic acid has a distinctive sour taste and pungent smell. It is mainly produced as a precursor to aluminum trifluoride and synthetic cryolite. It is commonly used as a source of fluoride for water fluoridation. Concentrated hexafluorosilicic acid is corrosive and toxic, but dilute solutions, as sometimes encountered in fluoridated water, are noncorrosive and beneficial to dental health. Salts derived from hexafluorosilicic acid are called hexafluorosilicates. Hexafluorosilicic acid is generally assumed to consist of oxonium ions charge balanced by hexafluorosilicate dianions as well as water. The situation is similar to that for chloroplatinic acid, fluoroboric acid, and hexafluorophosphoric acid. Hexafluorosilicate is an octahedral anion, the Si–F bond distances are 1.71 Å. Hexafluorosilicic acid is only available commercially as solution. Hexafluorosilicic acid can also be produced by treating silicon tetrafluoride with hydrofluoric acid. The resulting salt Na2SiF6 is mainly used in water fluoridation. Related ammonium and barium salts are produced similarly for other applications. Hexafluorosilicic acid is also converted to a variety of useful hexafluorosilicate salts. The potassium salt is used in the production of porcelains, the magnesium salt for hardened concretes and as an insecticide, and the barium salts for phosphors. Hexafluorosilicic acid is also commonly used for water fluoridation in several countries including the United States, the United Kingdom, and the Republic of Ireland. In the U.S., about 40,000 tons of fluorosilicic acid is recovered from phosphoric acid plants, and then used primarily in water fluoridation, sometimes after being processed into sodium silicofluoride. In this application, the hexafluorosilicic acid converts to the fluoride ion (F−), which is the active agent for the protection of teeth. Hexafluorosilicic acid is also used as an electrolyte in the Betts electrolytic process for refining lead. Hexafluorosilicic acid (identified as hydrofluorosilicic acid on the label) along with oxalic acid are the active ingredients used in Iron Out rust-removing cleaning products. H2SiF6 is a specialized reagent in organic synthesis for cleaving Si–O bonds of silyl ethers. It is more reactive for this purpose than HF. It reacts faster with t-butyldimethysilyl (TBDMS) ethers than triisopropylsilyl (TIPS) ethers. Hexafluorosilicic acid and the salts are used as wood preservation agents. ↑ "CDC - Water Fluoridation Additives - Engineering Fact Sheet - Community Water Fluoridation - Oral Health". Cdc.gov. Retrieved 2015-03-10. ↑ The New Zealand Institute of Chemistry (NZIC) - Hydrofluorosilic acid and water fluoridation hydrofluorosilic acid. ↑ J. P. Nicholson (2005). "Electrodeposition of Silicon from Nonaqueous Solvents". J. Electrochem. Soc. 152 (12): C795–C802. doi:10.1149/1.2083227. 1 2 Aigueperse, J.; Mollard, P.; Devilliers, D.; Chemla, M.; Faron, R.; Romano, R.; Cuer, J. P. (2005). "Fluorine Compounds, Inorganic". Ullmann’s Encyclopedia of Industrial Chemistry. Weinheim: Wiley-VCH. doi:10.1002/14356007.a11_307. ↑ Finney, William F.; Wilson, Erin; Callender, Andrew; Morris, Michael D.; Beck, Larry W. (2006). "Reexamination of Hexafluorosilicate Hydrolysis by 19F NMR and pH Measurement". Environ. Sci. Technol. 40 (8): 2572–2577. doi:10.1021/es052295s. ↑ Pilcher, A. S.; DeShong, P. (2001). "Fluorosilicic Acid". Encyclopedia of Reagents for Organic Synthesis. John Wiley & Sons. doi:10.1002/047084289X.rf013. ↑ Carsten Mai, Holger Militz (2004). "Modification of wood with silicon compounds. inorganic silicon compounds and sol-gel systems: a review". Wood Science and Technology. 37 (5): 339. doi:10.1007/s00226-003-0205-5. 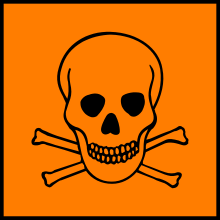 ↑ "CDC – Fluorosilicic Acid – International Chemical Safety Cards - NIOSH". Cdc.gov. Retrieved 2015-03-10.